The support usually given for this goes back to scholastic theology, though as Thomist Michael Chaberek has pointed out the justification for this association is dubious. In fact, TEs (not usually much interested in Aquinas) seem to gain their gut-support for this mysteriously absent God more from the way that “nature” as God’s orderly government in early modern science became capitalized as “Nature” during the later Enlightenment, “Nature” being the autonomous machinery of the distant clockmaker God. In the nineteenth century, as is inevitable once God is removed from scientific discourse, “Nature” became simply what is, and God a redundant explanation. Hence Carl Sagan’s being scientifically uncontroversial when he broadcast across the world that “The Cosmos is all that is or was or ever will be”. TEs therefore have to juggle uneasily between a materialistic science that can easily do without God, and a faith that regards him as all in all. And so from the former they inherit materialistically-defined concepts like “natural causes” and “randomness” as things distinct from God’s governing will, and God’s governance remains, at best, ambiguous. In my last post I pointed out the problem caused to this view by the miracle of the healing of the cripple by Peter and John in Acts, which was the direct work of the glorified Lord Jesus. If the divine Son can be a cause of a miraculous event within the universe, then the principle that God may not act apart from the usual causes within the world falls flat. Conequently one has to justify his non-action in nature on other grounds – which, as I have already said, involves first divorcing “Nature” from God along Enlightenment lines. The New Testament miracles give a clue as to the core error in this view of God as entirely separate or hidden from his natural creation: it ignores christology. I made an attempt at a christological understanding of creation some time ago (here is the most relevant post in the series). 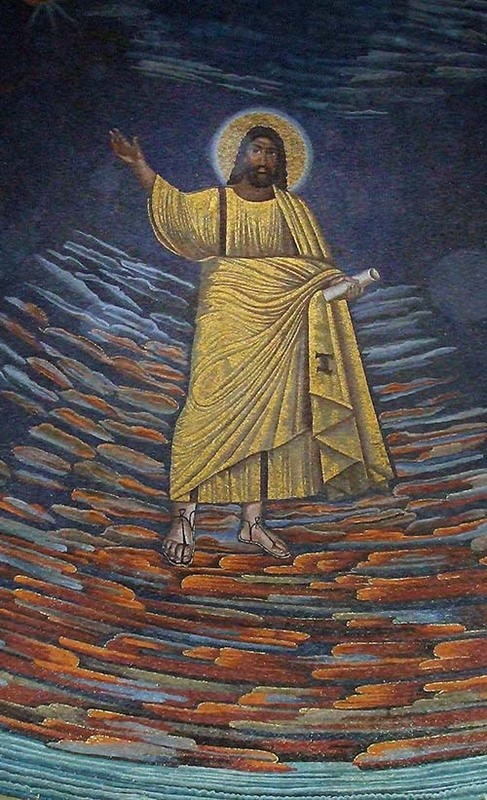 But there is a very deep and worthwhile (and long) article on the role of Christ as Logos by Giuseppe Tanzella-Nitti in the Interdisciplinary Encyclopedia of Religion and Science here. We are familiar, as Christians, with the wonderful truth that the eternal Son of God bound himself to our perishable world in the Incarnation, and I hope we always remember that he remains bound to it permanently by his risen body, as through him the Creation is eventually transformed. Meanwhile, there is a man in heaven, who walked the earth in human weakness and was a cause within the universe. The Christian Logos has a properly transcendent personality, who nonetheless wished to bind himself to space, time, and matter. Creation has in Christ its principle of subsistence; it was made in Him, by Him, and for Him; the humanity of Christ, therefore, can be considered as the fullness of creation, most fully revealing God’s plan. The logic of a new creation is already present in Christ, the new creation begun with the reconciliation in his blood and leading to its eschatological fulfillment in his glorious resurrection. The theme of the “pre-existence” of Christ is therefore implied, that is, the presence of the “mystery of the incarnate Word” at the dawn of the divine creation. Scripture affirms that He who makes visible that which in God is mysterious and invisible, “is before all things” (Col 1:17) and “is the firstborn of all creation” (v. 15). By these expressions, one is not affirming that he had been created first, nor that he is the temporal principle from which the series of all creatures would originate; rather, one is affirming his preeminence as universal mediator of all that was called into existence with creation. The original goodness of creation, affirmed by the account in Genesis, is certainly an “exemplary” goodness, because the universe is like its Creator (cf. Gn 1:18; 1:31), but it is also a “final” goodness, because God desired the universe for the Word made flesh. Therefore, by his incarnation, the Word enters a world and a history which already belong to him. He does not “come to earth” as a stranger from a world far away, but as a king who comes to take possession of his Kingdom. In this respect, the miracles of Jesus are not interventions of a wonderworker, but rather demonstrations of the submission of a nature which exists in Him and by means of Him. “There is nothing that is and takes place but has been made and stands by Him and through Him, as also the Divine says, ‘In the beginning was the Word, and the Word was with God, and the Word was God; all things were made by Him and without Him was not anything made.’ For just as though some musician, having tuned a lyre, and by his art adjusted the high notes to the low, and the intermediate notes to the rest, were to produce a single tune as the result, so also the Wisdom of God, handling the Universe as a lyre, and adjusting things in the air to things on the earth, and things in the heaven to things in the air, and combining parts into wholes, and moving them all by His beck and will, produces well and fittingly, as the result, the unity of the universe and of its order, Himself remaining unmoved with the Father while He moves all things by His organizing action, as seems good for each to His own Father […]. For with the single impulse of a nod as it were of the Word of God, all things simultaneously fall into order, and each discharge their proper functions, and a single order is made up by them all together” (St. Athanasius, Oratio contra Gentes, 42-43: PG 25, 83-87; cf. also De Incarnatione Verbi, I). Now, exactly how all this relates to “creation through evolution” is not stated by Athanasius, who knew nothing of evolution. But such a christological view of creation, which is the theological heart of the matter with or without evolution, seems to me poles apart from all the half-explanations for God’s non-involvement in observable natural events: the all-sufficiency of “natural laws”, the “co-creation” role of Nature or its “autonomy” or “sponaneity”, God’s “use” of “chance” (for reasons that are confused theologically and by means that are incoherent philosophically) and so on. Rather the Logos, the “Wisdom”of God, is the sole source of its order, its intelligibility, and its information, which therefore cannot begin to be understood without him. These arise from exactly the same intimate, loving, concern for the world, which is the Son’s own precious gift from God, that led him to take on flesh. And whilst in that flesh, he showed that his concern existed in real time – not only in the miracles I have mentioned, but in his personal connection with the circumstances and destinies of individual people. The same intimate concern continues in the Book of Acts, where the growth of the Kingdom is presented as the work of Christ, not only through his willing co-workers in the Church, but through his control of the Jewish and Roman authorities and – particularly relevant for us – through nature. Fast-forward to Revelation and the glorified Son unseals the Father’s plan for the whole of history as well. And so salvation (in real time) is not to be separated from creation (in real time), because the same unique Son of God is the author of both, and for the same reason – love for what was created in him, through him and for him. If “Evolutionary Creation” cannot be explained christologically, then it is a wrong turn. “It is, then, proper for us to begin the treatment of this subject [the Incarnation of the Word] by speaking of the creation of the universe, and of God its Artificer, so that it may be duly perceived that the renewal of creation has been the work of the self-same Word that made it at the beginning. For it will appear not inconsonant for the Father to have wrought its salvation in Him by Whose means He made it” (St. Athanasius, De Incarnatione Verbi, 1: PG 25, 98; on this theme cf. also John Paul II, Dives in misericordia, 7). This entry was posted in Creation, Science, Theology, Theology of nature. Bookmark the permalink. If “Evolutionary Creation” cannot be explained christologically, then it is a wrong turn. Therefore, when as Jesus Christ he turns water into wine, or calms a strom, or raises the dead, it is not an irruption of divine power into Nature, but the Logos acting in his special realm just as he always has. It is not an intervention, but his proper and usual business. I was thinking about the image of God the other day and how Christ is the fulfillment of that image. Yes – both the fulfilment and the original of the image. Edgcumbe-Hughes “The True Image” is excellent on that. With regard to purpose, or teleology, we cannot doubt that God began with the end in mind. There are many ways of approaching the characteristic of the finality of creation. In a first approach, finality means that the created world, the effect of an intelligent Creator, free and personal, bears a positive quantity of information and therefore embodies a meaning. This consideration is connected to the reflections already referred to with regards to the intelligibility and rationality of creation, but here adds the incompatibility with those visions of the cosmos which consider its coming into existence (or even its “creation”) as a chance event, or the appearance of life and of the human person as an epiphenomenon. Elsewhere he’s even more clear that randomness is the antithesis of finality. Purpose comes first, logically speaking (and that is in the mind of the Father), and the efficient means are created suitable to the end (and that is in the work of the Son through the Spirit). And so material, efficient, formal and final causation are diffent facets of the same jewel. A truly open-ended efficient cause (if such were to exist) would necessarily be at odds with the final cause, if only because it has no meaning. 1. Causation (mechanism): what are the stimuli that elicit the response, and how has it been modified by recent learning? How do behavior and psyche “function” on the molecular, physiological, neuro-ethological, cognitive and social level, and what do the relations between the levels look like? 2. Function (adaptation): how does the behavior impact on the animal’s chances of survival and reproduction? 3. Evolution (phylogeny): how does the behavior compare with similar behavior in related species, and how might it have arisen through the process of phylogeny? Why did structural associations (behavior can be seen as a “time space structure”) evolve in this manner and not otherwise? 4. Development (ontogeny): how does the behavior change with age, and what early experiences are necessary for the behavior to be shown? Which developmental steps (the ontogenesis follows an “inner plan”) and which environmental factors play when/which role? Interestingly, as a recent paper pointed out, these correspond to Aristotle’s four causes: 1. Efficient cause (mechanism), 2. Final cause (function), 3. Formal cause (evolution), and 4. Material cause (ontogeny). Ah – the only way to get away from Aristotle is to pretend you’ve got away from him and change the terminology! Robert Rosen. He’s particularly concerned with formal causation in life, ie its organisation, as being quite independent of the molecular and ergo material properties of the organism. Suppose (!) one day we had better ideas, concepts or theories about what it means for God to be ‘hands on’. (1) Do you think that God always interacts with the physical world directly? (2) Do you think that God interacts with the physical world more often by means of spiritual and mental processes that are not themselves divine? (3) We will never know? (A) If there is more that we can know, will we find the needed concepts from Bible texts? (B) Do we need other sources of concepts? If so, should Christians accept them? My background thought in writing this was “further work required” if teleology becomes acceptable in biology. I wasn’t promoting occasionalism here, but simply observing that even in our own experience, the distinction between our own action and God’s action in us isn’t always clear. Doubly so for another’s action – I may know I’m inspired, but the next guy might think I’m a fraud. In the case of inherent teleology in nature (the main subject of the OP), one is talking about secondary causation, God’s acting providentially and indirectly. My doubts arose from the question of whether all the events in nature – and especially the creation of new and wonderful forms – can really lie within the inherent powers of humble cells. If not, and God creates directly in some cases rather than through generation, it might be impossible to know unless we are able to develop tools to distinguish sources of teleology: and nobody’s been interested in such a project since the 17th century at least. To fail to do so risks teleology being reinstated at the expense of pantheism. That might be my response to your first set of questions. The second set of questions applies in all our enquiries, really: it’s a commonplace that the Bible text gives us some clear teaching and some we consider to be in cultural context. The problem is that the cultural context is also partly a corrective to our own (for example, miracles happned in a culture where miracles were not precluded). It’s also the case that other sources of knowledge have always been integrated into the understanding of what, in the Bible, in largely narrative. The Fathers did a largely good job of applying a Greek philosophical grid to the Bible texts, and that has been challenged in the last century, but to an extent rehabilitated as people saw what a careful job they had done. However “other philosophies are available”. As are other sciences – I’m currently reading Dante’s Divine Comedy, and it’s interesting to see 13th century science integrated with the text. Do we accept mediaeval science? No, but if we’re wise (I think) it will prevent us absolutizing our own, in relation to the big issues the Bible deals with. One might bracket personal experience with science as a source of knowledge, too.